The 10B students stared at the rows of lockers located at the back of the class, mentally staking out their desired lockers. 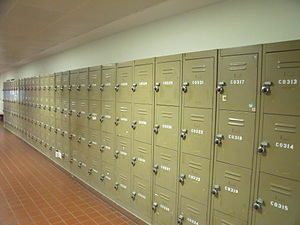 Rows 2 and 3 were especially desirable as they were the only ten lockers at correct eye level. However, this would mean the other 21 students would have to settle for a locker that is too high or one which you have to lie down on the floor to access. Although we were only supposed to collect the locker keys from the bookshop during lunch time, shortly after 11a.m., a student went out of class on the pretext of going to ‘toilet’.However, he walked back into class shortly, claimed to have forgotten his ‘toilet paper’ and grabbed a piece of paper which everyone knew it was the consent form for the lockers. Yet, he came back with a key instead. So, as he went to the ‘toilet’, another student followed suit and got the very much desired row 2 locker. This student opened his locker for the first time amid cheers of the rest of us for the opening ceremony of his locker. However, after a student received a row 4 locker, we realised that lockers were given away horizontally. So began the careful calculation and attempts to trick unsuspecting classmates to take the remaining lower lockers. When the locker row reached 6, began the mad dash of four students to get their locker. When we were in the line, we realised that the row 6 locker had yet to be taken. We tried to push each other to the front of the line and only stopped when more of our classmates came along. So we ‘generously’ allowed them to go first. I think we may have scared the primary kids who were also in line. As we stood in line, some 10E students walked past, scoffing at our eagerness and lateness of receiving our locker keys; forgetting they too acted just as excitedly when they first received their lockers. After a while, another student came down from class on the pretext of scolding and chasing us back to class. However, he stood in line to get his key too! Well, the ones who ‘generously’ allowed our classmates to take their keys first, we all managed to get our desired lockers. There was one student that even though he was short, insisted on taking a row 1 locker. Now he has to stand on a chair to reach his locker! Serves him right.